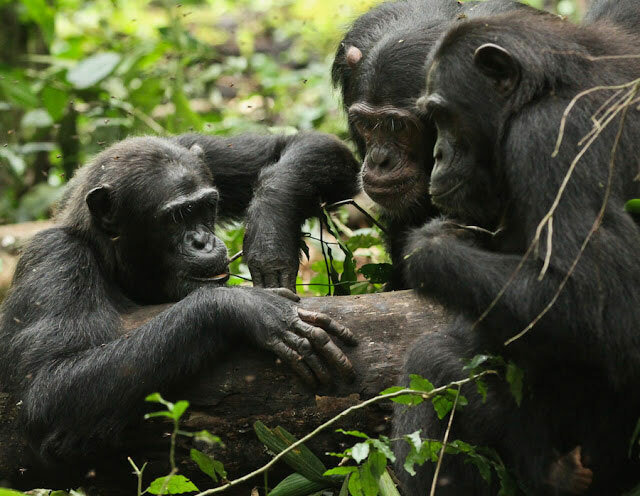 Three chimps are engaging with honey trap experiment in Kibale National Park. A low quantity of ripe fruit also increases chimpanzees’ motivation to acquire new foraging skills, but the effect is less pronounced than travel. “Our results show that travel fosters tool use in wild chimpanzees and it may also have been a driving force in early technological evolution by humans,” says Dr Thibaud Gruber from the University of Geneva. The team reviewed data from nine other chimpanzee communities to confirm the pattern. Chimpanzees’ closest relative, the Bonobo, travels around the same average distance as the Sonso and other Ugandan chimpanzees and uses a similar set of tools. Gorillas and most orangutans show limited or no feeding-related tool use and spend significantly less time travelling per day on the ground compared to chimpanzees. In contrast, modern human hunter-gatherers walk on average 11.4-14.1 km per day and use many more tools than any of the great apes. “After seven years of field work, I had a massive amount of data and there was clear variation in how chimpanzees engaged with the experiment. I thought it would be interesting to analyse why,” says Gruber. He deployed the “honey trap experiment”. The Sonso chimpanzees already used their fingers to take honey from bees’ nests, with limited success. In the “honey trap” experiment, a hole is drilled into a log and partially filled with this tempting prize so it can only be accessed with an implement. Most of the individuals who successfully extracted honey employed the community’s habitual tool, a folded leaf sponge, while two used a stick. A total of 21 instances of tool use were observed in 11 individuals. “We didn’t expect travel to be that important, and were surprised that it had an even greater influence than if they fed less on their preferred food of ripe fruits,” says Gruber. The team conclude that travel created an extra need for high-energy food while the challenge of inaccessible honey created an opportunity for innovation. The team did not analyse the potential influence of social learning to influence it. In 2011, Gruber and a colleague Catherine Hobaiter from the University of St Andrews discovered that the community’s use of moss as a sponge emerged from one individual named Nick, whose behavior was copied by a dominant female and quickly spread. “When times are changing, you have to adapt your behavior and our data illustrate that chimps will pay more attention to the possibilities offered by their environment in more demanding periods,” says Gruber.